Ahh home after a week long road trip, and it feels so good. The girls are in their own beds, fast asleep and I'm sitting here eating chocolate :) We traveled the length of the North Island (NZ), just the girls and I, on the way down there to see my family and then the Chief flew down to drive us and the green caravan (called Towbe/Toby) back up north. We are absolutely rapt with the caravan - it's the cutest little 70's gem. Perfect size for our family - it has an awning for the girls to sleep in during summer holidays. It's in great shape, but I have a little redecorating to do (Red/Green stripe curtains and some bunting are at the top of my list). Loads of fun with family, friends, Autumn beaches and sightseeing. I did have time for some crochet while away - but I had a tragedy when I lost my only 4.5mm hook down the front of the car (who knew a hook could wedge itself between the windscreen and the dash - never to be seen again).... worse though is that the shops are all shut due to Easter so no new hook until Tuesday!!!! I guess I just have to pull out one of my other projects. Granny squares here I come again. What a fabulous post hon! 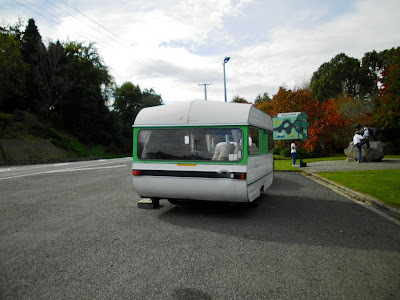 I adore your caravan and am green with envy - at least I match the colour scheme!! !